Earned sick days guarantee workers the right to job-protected paid time from work when they need time to care for their own health needs and those of family. 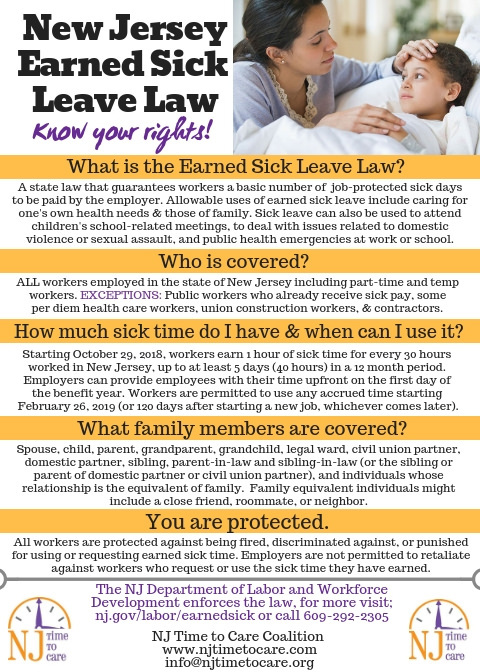 Currently, no federal law guarantees workers access to earned sick & safe days when they or their family members are sick, or when they need to deal with medical, legal or relocation issues related to domestic violence or sexual assault. 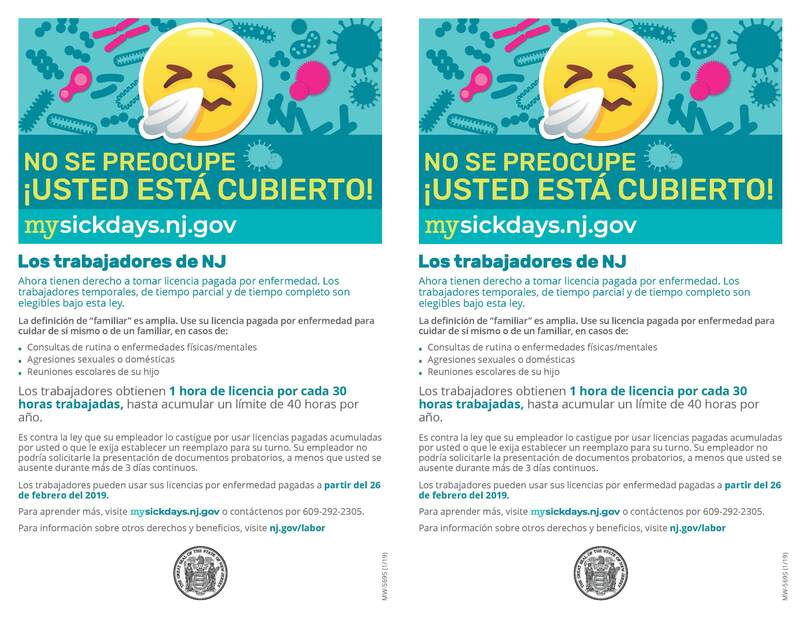 Prior to the enactment of Earned Sick Days in New Jersey, over a million workers in the state did not earn a single paid sick day. Many who previously lacked paid sick days worked in low-wage service jobs, caring for our children and the elderly, and preparing and serving food in our restaurants. Before the New Jersey law, they often were unable to afford to stay home to take time to recover. The new worker protections can help slow or stop the spread of illness, making healthier and more productive workplaces in New Jersey. Workers recover faster and can access medical care – allowing them to get back to work sooner and lowering health care costs. With earned sick days it is possible to be both a good employee and a good parent or family caregiver. Earned sick days boost our families, our community and our economy. New Jersey Assembly Bill No. 1827, introduced by Assemblywoman Lampitt, and Senate Bill No. 2171, introduced by Senate Majority Leader Loretta Weinberg, also known as the Earned Sick and Safe Days Act, was signed into law by Governor Murphy on May 2, 2018. The law grants New Jersey workers the right to job-protected paid time from work to care for their own health needs and for the health needs of family members. Nearly ALL workers, full-time, part-time, temporary, and undocumented workers employed in New Jersey are covered (see exemptions further below). Workers earn 1 hour of paid sick time for every 30 hours worked, up to a maximum of 40 hours (5 days) in a 12-month period. The New Jersey Department of Labor and Workforce Development will oversee enforcement of the law. To file a complaint visit nj.gov/labor/wagehour/complnt/filing_wage_claim.html or call 609-292-2305 between the hours of 8:30 a.m. and 4:30 p.m., Monday through Friday. Workers start to accrue paid sick days as soon as they begin employment (of the effective date of the act), and must wait 120 days before being able to use the days. Workers can carry-over unused earned sick days from year to year, but employers will not be required to provide more than 40 hours in any given 12 month period. Employers can offer, and workers can accept, to be paid for unused sick days at the end of the benefit year. The benefit year must be defined by the employer and communicated to employees in advance. Employees cannot be required to bring in medical documentation (like a doctor's note) unless they are out for at least three consecutive days. Businesses that have paid time off and/or vacation time policies that are provided in the same amounts (and that can be used for the same purposes and under the same conditions as under the law) won’t have to change their sick leave policy. Employers must provide employees with a notification of their rights under the law as well as post in the workplace. See the notice issued by the NJ Department of Labor and Workforce Development at www.state.nj.us/labor/forms_pdfs/mw565sickleaveposter.pdf and additional languages here. Employers are not permitted to take retaliatory action or discriminate against an employee who requests or uses their allowable earned sick days. Covered family members include: spouse, child, parent, grandparent, grandchild, legal ward, civil union partner, domestic partner, sibling, parent-in-law and sibling-in-law (or the sibling or parent of domestic partner or civil union partner), and individuals whose relationship is the equivalent of family. Family equivalent individuals might include a close friend, roommate, or neighbor. For an employee’s own mental or physical illness, injury or other adverse health condition, or for diagnosis or preventive medical care. For an employee’s need to care for family members (see covered family members above) when they fall ill or are in need of diagnosis or preventative medical care, or to provide care dealing with issues arising from domestic or sexual violence. To deal with medical, legal or relocation issues related to domestic violence or sexual assault, or to receive services from a designated domestic violence or victim services agency. In the event a public official closes a place of business or place of care or school of a child, due to a public health emergency. To attend a school-related conference, meeting, or other event requested or required by a school, or to attend a meeting regarding care provided to the child in connection with the child’s health condition or disability. Construction workers with Collective Bargaining Agreement. Public workers with sick time covered under state law, rule, or regulations. Municipal and county employees are covered under the law. Per diem licensed (or in the process of gaining licensure) health care employees who work on an as-needed basis to supplement, replace or substitute a health care employee; who work only when the they indicate they are available to work and they have no obligation to work when they do not indicate availability; and they either have the opportunity for full-time or part-time employment; OR they have waived earned sick leave benefits for alternative benefits or consideration. This per-diem exemption does not include certified homemaker-home health aides. Contractors, freelancers, etc – workers who are not considered “employees”. Click Here For Earned Sick Day Resources, Research and Reports.